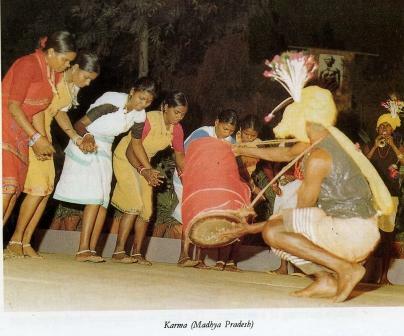 Karma dance is performed by many tribal communities living in Bihar, Orissa and Madhya Pradesh, in varying forms and styles. One factor is common that the ceremony of Karma is performed to bring prosperity to the community and a branch of Karma tree is brought and planted around which the dance is performed. Although it is basically a tribal ceremony, a few non-tribal communities also observe it. Invariably a legend is associated with each style of Karma dance. The karma legend associated with the dance prevalent in eastern Madhya Pradesh runs as follows : Once upon a time there was a very benevolent king by name Karmachand. When he was defeated by the army of the neighboring kingdom he fled to the forest. One day he saw some lamps burning at a distance. The king was surprised and went near the lamps. He found that a god was sitting on his throne and young girls are dancing before him. The moment they saw the king they vanished. Karamchand went and fell prostrated at the feet of the god who asked him what he wanted. The king begged the god to return his kingdom to him. The god said that if the king performs Karmapooja he will get back his kingdom. As advised by the god, Karmachand sent unmarried girls to bring a branch of the Karma (kadam) tree which was planted on a sanctified place. The branch was worshipped and the Karma dance was performed throughout the night. In the morning the branch was ritually floated down the river. Immediately the king got the news that his enemies have fled the kingdom. He thus got back his throne. Those who want to avert their misfortune should observe the Karma ceremony exactly as the king did. The Karma ceremony is held in the lunar month of Ashwin, corresponding to September/October. In the eastern Madhya Pradesh it is performed thrice. The first is held on third day of Ashwin. In this only unmarried girls take part. The second is held on the eleventh day in which both unmarried girls and boys participate. The third is observed just twelve days after the second in which women also take part, irrespective of whether married or unmarried. The rituals and dance remain the same for all the three observances. The Karma observed by the tribal communities of Chhatisgarh is associated with a legend which is different and has some similarity with that prevalent in Orissa. Both tribal and non-tribal communities living in the district of Sambalpur and Phulbani in Orissa observe the Karma festival. Here the ceremony also includes some entertaining items. The legend associated with the Karma of Orissa is as follows : Six sons of a rich merchant set sail in a ship for trade, leaving the youngest at home. When they returned they found that their wives are dancing Karma dance and the youngest brother is playing the drum. Enraged they drove away their wives. The karma god was angry and the wealth of the six brothers vanished. They went to the god and prayed that their wealth may be restored to them. The god said that if they take back their wives and continue to observe the Karma they will regain their vanished wealth. They did exactly as the god wanted them to do and they got back their wealth. From that day Karma festival is being celebrated every year in the month of Ashwin. In Bihar also a few non-tribal communities like Mahato, Malah, Chamar, etc observe the Karma ceremony like the tribal, but it is held during the rainy season and related to transplanting of paddy.